THE HIPPO IS BACK!!! Better than ever. 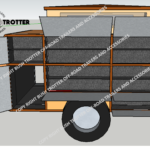 Bush Trotter manufactured the Hippo for a limited series some years ago. 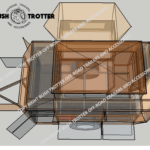 Based on the frequent requests that we have received, we have decided to manufacture another range of the popular Bush Trotter Hippo. Some prefer to sleep inside vs on top. Many of you don’t need more than the spacious double bed inside. 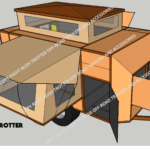 Well the new Bush Trotter Hippo is just for you. The new Hippo has some enhancement features though. The modern design features a rear door vs the side door on the previous model. This provides for more space in the kitchen and optimal use of the interior space. 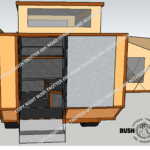 Inside you will find ample packing space in the clothing cupboards and the fridge compartment is separate and insulated from the interior. The fridge will share the available space with your ammo boxes that is accessible from the outside. The fold out double bed features some extra length for that little bit more comfort. Surrounded by the L-shape tent with sides to close of the entire area should you wish to. 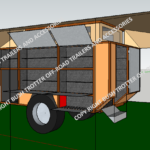 The aim of all off-read trailer and caravan designers are to find the balance between rugged design vs weight, size vs space, price vs comfort. We believe the new Bush Trotter Hippo has hit the spot. 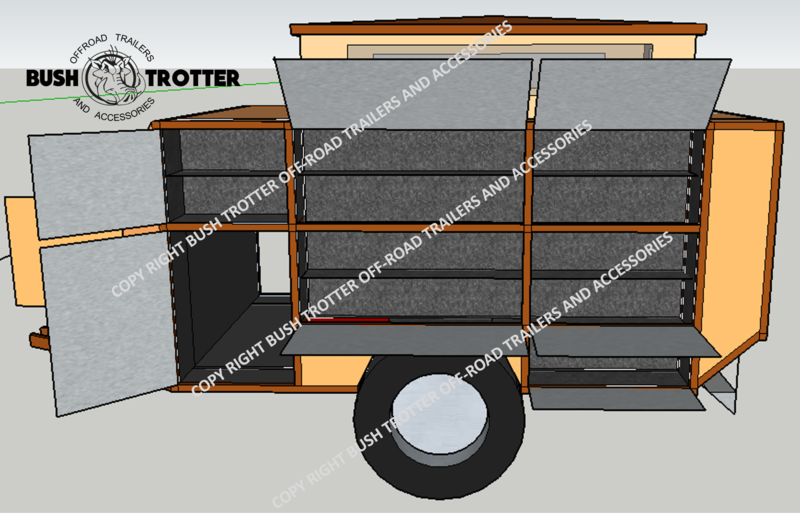 The result is the culmination of comfort and style while still being as tough and rugged as what all Bush Trotter Trailers have become known for. Please share your thoughts and comments, we would love to hear from you.